Corrected: Calling all members: 1st Franklin Candidate Forum next week! 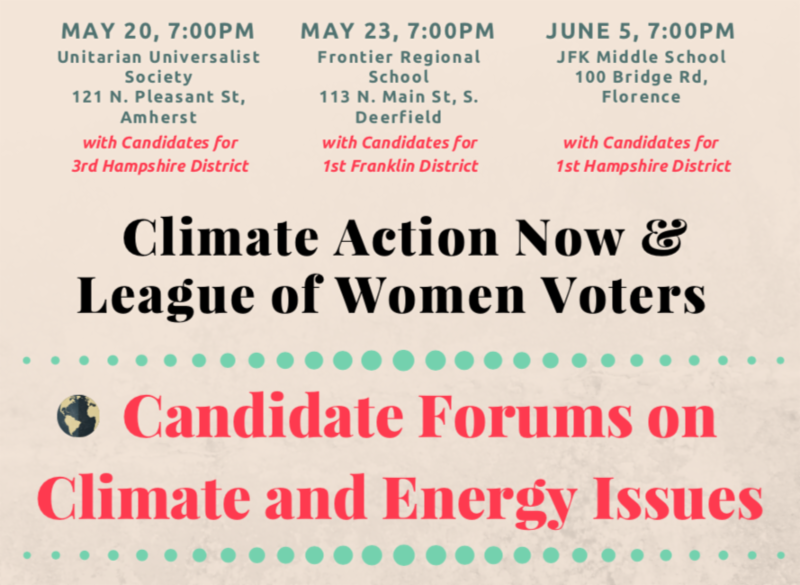 The League of Women Voters has partnered with Climate Action Now to present a series of forums on climate issues with the candidates running for seats in the State House of Representatives. Next WEDNESDAY, May 23, we'll hold the forum for our region, the 1st Franklin District, which consists of Ashfield, Buckland, Conway, Deerfield, Leverett, Montague, Shelburne, Shutesbury, Sunderland, Whately, Chester, Chesterfield, Cummington, Goshen, Huntington, Middlefield, Plainfield, Williamsburg, and Worthington. All eight candidates will participate! We hope you'll join us, either as interested constituents, or as volunteers for your League. We'll need time keepers, runners, greeters, and tabling staff. Please let us know if you'll be attending , or if you can help . This Saturday is our May open meeting at 3:30pm at the Greenfield Public Library . This will be our last open meeting till September, though we'll continue to hold social meet-ups, voter registrations, and other activities. In June, we'll hold our Annual Meeting, so stay tuned!